The couple decided to undertake extensive redecoration throughout. They hoped to extend the kitchen and reorganise the layout to make the space feel less cramped. In addition to accommodating the children, the room also needed to work for entertaining friends, so a large dining table was important. 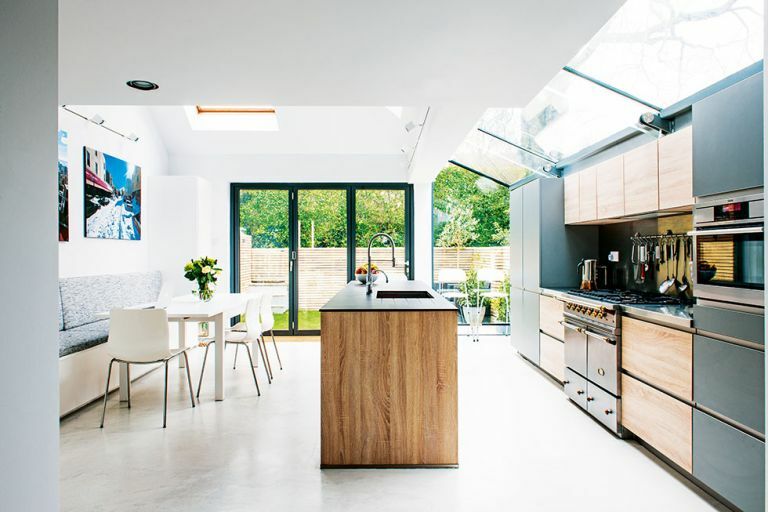 Find out what they did next, then browse through more real home transformations and read more about extending a house. Planning permission was required for the alterations, in addition to complicated party-wall agreements, which delayed progress by three weeks, despite planning permission being granted quickly. The uPVC side conservatory, rear wall, roof and a boiler-room outhouse were demolished, and reclaimed bricks used to rebuild the rear wall, where structural steelwork and aluminium bi-fold doors have been installed, as well as a frameless glass roof and wall panel. A cat flap has been installed in the brickwork under a boiler cupboard so that the clean lines of the bi-fold doors remain intact. The full feature – including stockists and more images – appears in the October 2015 issue of Real Homes. Subscribe today to take advantage of our money-saving subscription offers.